Click on links below for specific articles, or other information, as available on line. Jaffrey Then & Now by Robert B. Stephenson & Catherine L. Seiberling, 1992, Jaffrey Historic District Commission, Jaffrey, New Hampshire. A collaborative book on historical architecture and its many changes and transformations in a diverse rural town. "Of Willa Cather's Lasting Love for the Frontier," Literary Hub [LitHub.com], December 7, 2018 – Article that appeared on Willa Cather's birthday about her very busy 1918. "An Enchanted April," Victoria Magazine, April 2015 – Personal essay about my grandmother's experience in France with her twin sister, and later my own. "Sit at Your Desk and Write," Early Homes, Fall-Winter 2014 – Personal essay on writing (and beloved desks and places in the process). "Mountain Minted," STORY Magazine, Spring 2013 – Feature article on Kentucky mint and the history of, and recipes for, the classic mint julep (with author's photographs). "Curating at Midlife," Early Homes, Fall 2012 – Essay about turning fifty and starting to pare down to life's essentials while sifting through old stuff [see above] (with author's photographs). 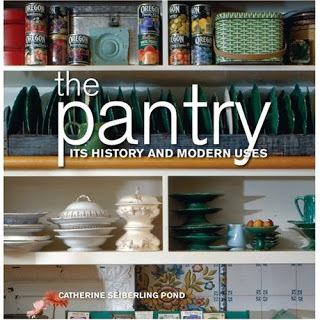 "Pantry Design Ideas for Every Era," Special "Kitchens" issue, Old-House Interiors, Fall 2011. "Step in Time," Early Homes, Spring 2011 – Personal essay about raising historic-minded children in a Disney world. "Nostalgia or a Clean Slate?" Early Homes, Autumn-Winter 2010 – Personal essay about sentiment, retro, and the artisanal in the loop of history. "Christmas Heartfelt & Homemade," Victoria Magazine, Nov/Dec 2009 – Personal essay about long ago Christmases with my parents in suburban Ohio. "A Tight Rope," Early Homes, Autumn 2009 – Personal essay about outdoor clotheslines. "Homeplaces," Early Homes, Summer 2008 – Personal essay about Kentucky homeplaces (with author's photographs). “Furniture Focus: Hoosier Cabinets,” Old-House Interiors, October-November 2006 – Brief history of Hoosiers and other kitchen cabinets. “The Empty House,” Early Homes, Autumn-Winter 2006 – Personal essay about selling our beloved farm place after 60 years in the family. “The Romance-and Reality-of the Sleeping Porch,” Old-House Interiors, June-July 2006 – The history of the sleeping porch in American homes. “True Color,” New England Home, November 2005 – A mountainside retreat in rural Vermont. “A World of Difference,” New England Home, September 2005 – Cover story in inaugural home magazine about a new shingle-style home in the Boston suburbs. 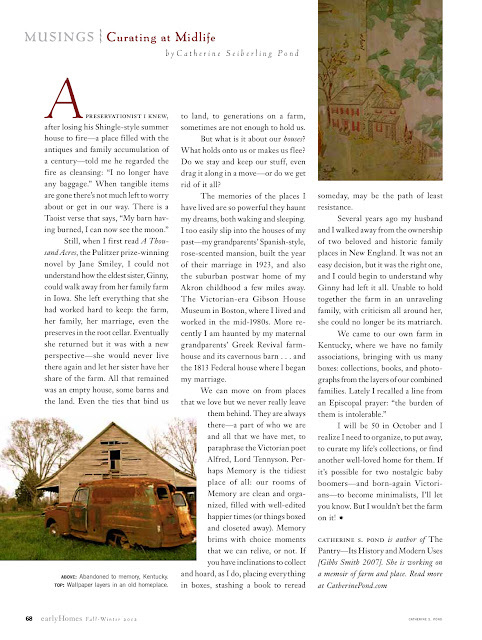 “Ravings from the Pantry,” Old-House Interiors, June-July 2005 – Personal essay about various finds while organizing my kitchen and pantry cupboards. “Lyndhurst,” Old-House Interiors, Special “Victorian Design” issue, Winter 2005 – The Gothic Revival mansion in Tarrytown, NY owned by the National Trust for Historic Preservation. “Stenciling at the Source,” Old-House Interiors, January 2005 – A stencil restoration by Polly Forcier of the Moses Eaton homestead. “Raising Children in Old Houses,” Early Homes, Spring 2004 – Personal essay on the joys of child-rearing in a legacy house. “Pantries Then & Now,” Old-House Interiors, March 2004 – The evolution of pantries in American homes, including installation of two Victorian style pantries in the author’s Federal home. “On Lake Huron, ca. 1916,” Old-House Interiors, August-September 2003 – Archival photo piece on my family's once and future rustic island summer home, Cedar Lodge, in northern Michigan. “Boston Tea Party,” Yankee, May 2003 – Food feature and sidebars on a tea party at Nichols House Museum in Boston (complete with author-tested recipes). “Tudor Tutorial,” Old-House Interiors, November 2002 – On Stan Hywet Hall—built in 1916, Akron, Ohio by my industrialist great-grandparents and operated as a museum since 1957. “Barrett House: A Federal Manse,” Colonial Homes, November 1998 – Museum house owned and operated by Historic New England in New Ipswich, New Hampshire. “Keeping Summer: A Reminiscence,” Victoria, June 1992 – Personal essay on two white wicker chairs and their legacy. “From Louis Vuitton: The Case for Adventure,”Victoria, August 1991 – Musings on Victorian travel and the Louis Vuitton Museum in Paris. 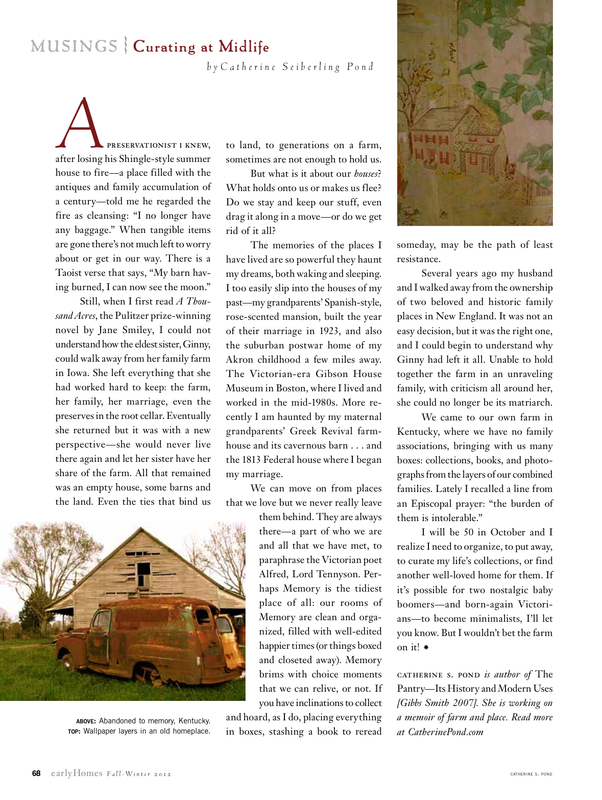 “Home Fires,” Victoria, January 1991 – Personal essay about sifting through books at a family farmhouse and finding hidden gems from ancestral women. “The Young Mistress of Gibson House,” Victoria, January 1990 – Personal essay, with photographs, of life as a resident guide at this unique Victorian house museum. Since 2015, I have been a paid contributor to a web magazine on country living at RethinkRural.com [link to my published articles here], where I also contribute my photography.